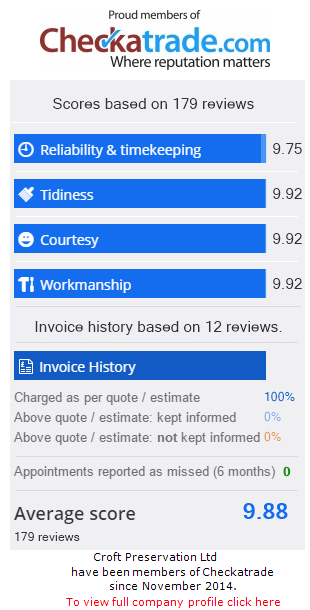 As professional providers of damp treatment and building services for customers across Dorset and Hampshire, we ensure that our work and conduct represents the best in the industry. Our list of accreditations is evidence of our dedication to delivering first-rate customer service and results. For damp, property preservation and building services you can trust to deliver long lasting and effective solutions, don't hesitate to contact our experienced team today on 01202 737739 and we will be more than happy to assist you with your enquiry. The Property Care Association (PCA) is the trade association representing building preservation and repair specialists in the UK, including the resolution of damp problems. Businesses that are members of the PCA have access to an unrivalled wealth of industry knowledge, are regularly vetted and are able to consistently demonstrate their ability to carry out their work for homeowners with technical competence, financial stability and good customer service. The criteria for membership also involves completion of several professional qualifications. As members of The Property Care Association, you can rely on Croft Preservation to resolve your problems with damp, condensation, ventilation, flood damage, woodworm and wood rot to the highest standard. The Federation of Master Builders (FMB) is the largest trade association in the UK for the construction industry and has been driving improvements and standards for over 75 years. The FMB has strict membership criteria, as well as requiring all members to adhere to a thorough code of practice. Choosing an FMB-approved building contractor is an excellent way of guaranteeing quality building services backed by a vast and experienced support network. As registered master builders, Croft Preservation has undergone all necessary procedures for membership, including an independent inspection to ensure that our building services are delivered to the highest quality. CITB is the Industry Training Board for the construction industry and is also a partner in the Sector Skills Council. It is the job of the CITB to encourage better work standards within the construction industry and encourage further training by those involved. The Site Safety Plus (SSP) is a course run by the CITB that extensively covers health and safety awareness in the workplace. Our Project Manager, Daniel Trickett, has completed the CITB Safety Plus course and all included assessments, so you can rest assured that your construction project, whether it's for a new extension or loft conversion, is in safe and capable hands. NHBC are the leading warranty and insurance providers for new homes in the UK. NHBC take an active role within the construction industry and provide inspections, guidance and training for builders to ensure excellent standards are upheld at all times for customers. An NHBC-registered builder must be able to demonstrate their ability to comply with all NHBC requirements and standards of practice. As registered members of the NHBC, we have not only demonstrated our ability to deliver excellent building services for our customers, but also have access to a wide range of NHBC products, services and expertise. The SafeContractor scheme is considered one of the leading health and safety accreditations for contractors operating in the UK and has been in operation for almost 20 years. Completion of the scheme involves demonstrating that your company is doing all it can to ensure exceptional health and safety compliance for its staff and customers, including a thorough assessment reviewed by an experienced auditor. We have been approved by SafeContractor for several years and are proud of the high standards of health and safety we maintain throughout all our damp and building projects. You can rest assured that our process is entirely up-to-date and compliant with governing industry standards. DELTA Membrane Systems has over 125 years of experience in waterproofing buildings and offer a wide variety of high quality basement waterproofing membranes. As registered installers of DELTA membrane products, we have access to their full range of products and have demonstrated our ability to carry out installation of these products effectively. You can depend on Croft Preservation for all your basement tanking requirements, safe in the knowledge that we only use the best waterproofing membranes on the market. Contractors approved by CGS Limited come with the assurance of an insurance-backed guarantee from Guarantee Protection Insurance Limited. This UK based insurer is regularly checked by the Financial Conduct Authority and represents the gold standard for customer protection. As CGS Limited-registered contractors, we can assure our customers that in the unlikely event we were to go out of business, any defects covered under our written terms and conditions will still be covered. Biokil Crown is one of the largest manufacturers and suppliers of construction and damp proofing material products in the UK. As Biokil-approved installers for their remedial cavity wall ties, we have demonstrated our ability to install these products to an excellent standard for our customers. If you have any further queries regarding our damp and property preservation services or our accreditations, don't hesitate to contact us on 01202 737739.